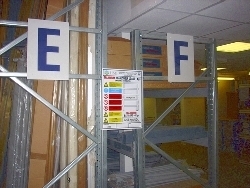 Load Notices and signage are vital elements of the safe efficient warehouse environment. Good safety signage which clearly displays loading capabilities of the racking and contact details should any accident or damage occur are now required by the Health and Safety Executive. Clearly labelled aisles and racks will speed up picking and reduce picking errors, especially where short term or temporary / agency staff are employed in the warehouse. Hampshire Mezzanine Floors can advise on best practice and we sell a range of aisle markers, plastic signs and magnetic labels. Hampshire Mezzanine Floors offer a rack safety survey which can include advising on rack loading requirements for existing Racking Installations.